Nestlé Philippines celebrates its 100th year launching the Sine Kasambuhay project. 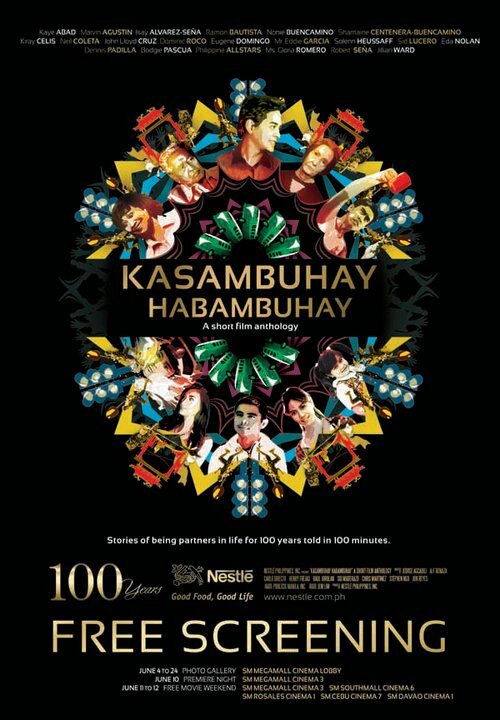 Featured in the Kasambuhay Habambuhay (Companion in Life, For Life) film anthology are 10 short films created by some of our finest commercial directors and writers in the country today who have helped shape Nestlé TV commercials. These short films share inspiring and poignant stories of how Nestlé has been part of the Filipino families for generations told in 100 minutes. The KASAMBUHAY HABAMBUHAY Short Film Anthology will be premiered on June 10 at SM Megamall and will be shown for FREE on June 11-12, 2011 starting at 11AM in selected SM cinemas nationwide (Megamall Cinema 3, Southmall Cinema 6, Rosales Cinema 1, Davao Cinema 1 and Cebu Cinema 7). On the “Free Movie Weekend,” 5 lucky viewers (1 per cinema) will get a chance to win P10,000 just by voting for their favorite short film or story at the end of the film showing. The ten stories featured the following Nestlé brands: BEAR BRAND Powdered Milk Drink, NESCAFÉ, MILO, NESTEA, NIDO, COFFEE-MATE, MAGGI, BEAR BRAND STERILIZED, NESTLÉ ICE CREAM, KOKO KRUNCH, NESTLÉ Fruit Selection Yogurt and NESTLÉ FITNESSE. The colorful and unique stories vary from personal to experimental with genres such as drama, romantic comedy, musical, fantasy, satire, family comedy, suspense, adventure, mock-umentary and Shakespearean parody. Watching the films made me laugh and cry at the same time. Don’t you ever miss this! I promise you that you will feel great after watching the films. I was able to watch the Kasambuhay Habambuhay Short Film Anthology last June 8, 2011. Thank you Nestlé Philippines for letting us experience the beauty of cinema and touching the hearts of every Filipino family. The film anthology will also be exhibited at the Cannes Lions Advertising Festival in France this June 2011. "Cannes Lions has had a strong relationship with Nestlé for a number of years, and we are delighted that the 100 year anniversary is being celebrated in this way," Philip Thomas, CEO, Cannes Lions International Festival of Creativity.